The colorful Green Jay is one of several dozen bird species that are most easily seen in the lower valley of south Texas. 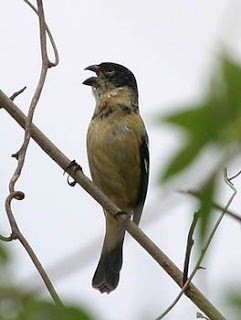 Unlike the Green Jay, the White-collared Seedeater is rare and local even in the lower valley. But with good local information, chances of seeing one are good. 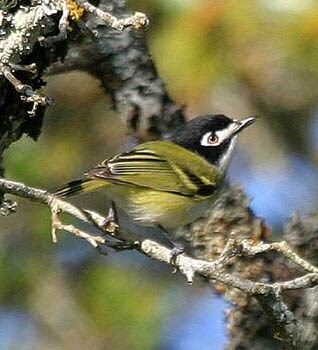 Black-capped Vireo is probably the most attractive of all the vireos. It isnt always easy to find but we have never failed in our quest. 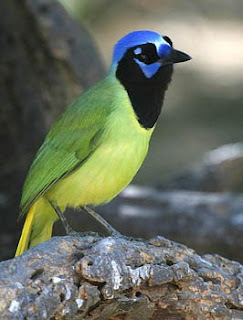 This male was photographed in Hill Country. Mexican free-tailed bats emerging at dusk from a cave near Concan in Hill Country. This spectacle is always a highlight of any trip to Texas. 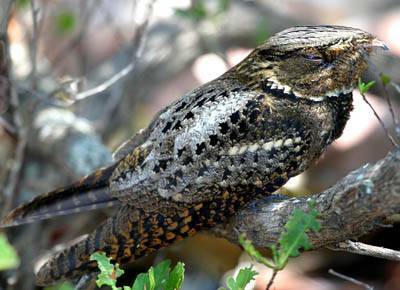 Chuck-wills-widow is one of many migrants regularly seen at sites along the coast. The King Ranch has the largest and most accessible population of Ferruginous Pygmy Owls in North America. This species is virtually guaranteed on a visit there. 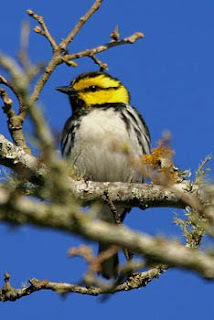 Golden-cheeked Warbler is an endemic breeder to the state of Texas and one of the most stunning of our wood warblers. Its just one of the many reasons a visit to Texas in April is a trip you will always remember! On our final full day at Canopy Tower, we spent an afternoon birding in Gamboa. Our guide Carlos Bethancourt had permission from a homeowner to stock their feeders with fruit and nectar. As soon as he put out this bounty, swarms of birds arrived. One of the stunning birds present in good numbers was Red-legged Honeycreeper. This male was in particularly good fresh plumage. The diversity of birds at the feeders was impressive. At least five species of tanagers were present including this Palm Tanager - not the most colorful but still this individual posed beautifully for a pic. While we were at their, the house owner Carmen, came out to say hello. She was annoyed with the many Orange-chinned Parakeets, which she referred to as the 'mafia' because of their aggressive and noisy habits! Still for us, it was great to see them up close. Our final morning at Canopy Tower was relaxed and we enjoyed some great views of the regulars including this Keel-billed Toucan, which had been enjoying the cecropia fruits. From Canopy Tower, we moved next to Canopy Lodge in El Valle for three nights. This beautiful facility has excellent rooms, food and great birding right on the grounds. The feeders were always busy, and there we were surprised to find that a pair of Rufous Motmots were regulars here. Our guide Tino Sanchez proved his worth on the first day when he took us right to a pair of Mottled Owls on a day roost - a real coup! Tino had two remarkable abilities. First, he could get birds in the scope faster than any of us had ever seen. Second, he could whistle almost any bird that chimed off from the forest. As someone who loves to mimic bird sounds, even I was impressed with his abilities. Our best bird at Canopy Lodge was probably Tody Motmot (great scope views), but we had lots of other good finds. We ended our trip here with an impressive group total of 320 species! Paul Pratt and myself arrived in Panama a day before meeting our group at La Estancia bed and breakfast. We birded the Rainforest Discovery center and tower along Pipeline Road before the and did some scouting there. Among the highlights were an incredibly co-operative White-whiskered Puffbird which sat at eye level for nearly twenty minutes! To start off the trip we returned to the beginning of Pipeline Road. Here we had great looks at several species of antbirds, Bright-rumped Attila, fruit crows, and several great encounters with trogons, including a female Slaty-tailed Trogon. Another good find was this male Black-throated Trogon, one of several yellow bellied trogons present here. On day four of the trip we moved to Canopy Tower where we will spend three nights. Our guide Carlos Bethancourt proved to be superb. In addition to a great sense of humour, his knowledge of birds and nature and his enthusiasm made him an outstanding guide. We also benefitted from the official hawk watcher at the tower Dan Berard, who was extremely helpful in pointing out birds and other critters such as Canopy Lizard. On our first full day at the tower we enjoyed no fewer than three male Blue Cotingas including the one below which perched for over ten minutes in clear view with the scope! On our second full day at the tower we returned to Pipeline road. This was truly a fantastic day with highlights including a perched Collared Forest Falcon in clear view, a Great Tinamou standing on the road to Semaphore Hill, and SCOPE views of Rosy-Thrush Tanager male gathering nesting material for ten minutes in clear view (!). This time we did the area beyond the gate. One of our main targets was the Streak-chested Antpitta - a secretive and local specialty of this area. Incredibly the ENTIRE group of twelve got to see the bird very well. 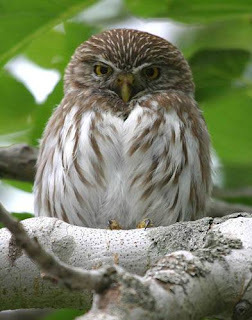 I was even lucky enough to secure this photograph of the bird. A little farther down the road Carlos picked up on the call of a Great Jacamar. After some tense moments the bird swooped low through the canopy and perched up so we could enjoy scope views for ten minutes. After all this it seemed almost greedy of us to want to see an army ant march, but we joked with Carlos that were hoping to see one. Not half an hour later and there they were right beside the road. 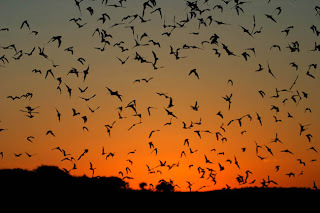 The swarm was attended by many Bicolored and Spotted Antbirds, two Black-faced Antthrushes, Barred, Black-striped and Plain-brown Woodcreepers, Gray-headed Tanagers, and at least six Occellated Antbirds. Here is an image of one of the Occelateds. All in all, a truly spectacular day of birding!